I love soups - especially thick, warm, spiced soups which are perfect to make in Autumn and Winter when it's miserable and cold outside. Soups are great because they are easy to make, can be frozen to use for later and they give you a massive hit of vitamins and nutrients that your body needs. This is one of my favourite soups and it is my Autumnal root vegetable soup made from two types of squash, carrots and herbs. The hard part is peeling the squash. If anyone knows of an easy way to peel these gorgeous vegetables, then please comment and let me know because I struggle! I end up having to chop them up into pieces and then peel the pieces - it takes ages. After you're all peeled, cut the squash into small chunks - this way it will cook quicker. Chop up the rest of the carrots into small chunks, and the garlic and onion into small pieces. In a pan, warm up olive oil and throw in the chopped up garlic and onion to brown. Once browned, throw in the squash and carrots to brown them. Let them brown for about 10 minutes, then pour in 3/4 of the chicken stock - let this now simmer on a low heat for about 20 minutes (remember to put the lid on your pan to trap the steam in!) Add in the sorrel, paprika and herbs de Provence and season with salt and pepper about 5 minutes before you take the pan off the heat. Once the squash is nice and soft, you can transfer the vegetables into a blender and add in the rest of the stock to thin the soon to be soup. Blend until smooth and remember that you can add in more stock to thin the soup - but I like mine thick! To serve, pour the soup into bowls, drizzle with a little olive oil and add in some grated Parmesan. I also made Parmesan toast to go with the soup - just grate some cheese on to toast pieces and place in the over until golden and crispy! I love this soup and you can make so many different variations of it - just experiment with tastes and vegetables. Today is the day that it saddens me to say that the chicken you all loved so much (pictured below) is dead. You can thank Liam for the demise of the chicken which is now in pieces. 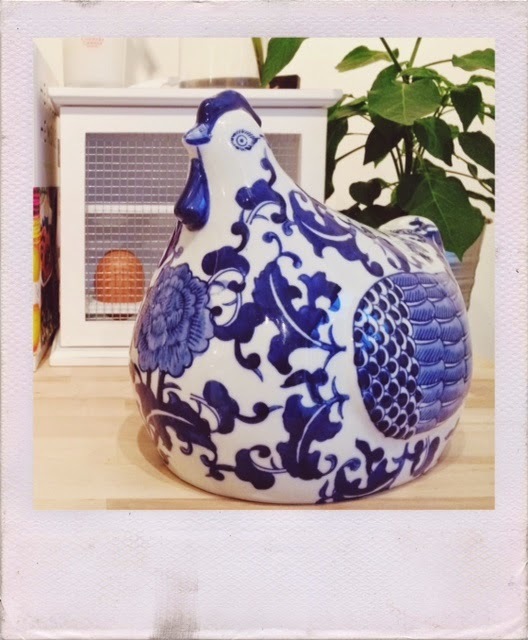 RIP chicken from HomeSense! These soup seems to be soooo delicious - I've made such a pumpkin soup in the past too! Great for colder harvest nights - and the best way to enjoy this one would be out on the sea by a fireplace or on the porch/terrace and watch on the near lake;)!